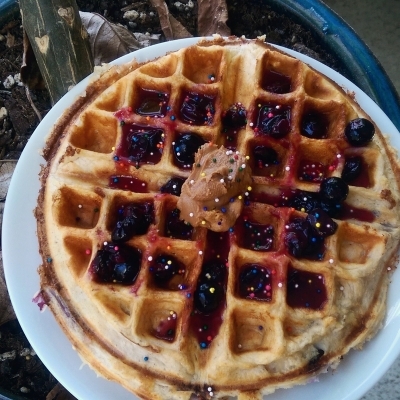 A basic protein waffle recipe! I topped mine with peanut butter, fresh blueberry compote, and sprakles cuz it was my birffday :D These make great pancakes too! -Preheat waffle iron to med-high heat. -When iron is ready, pour in batter. -Let cook approx. 5 minutes or until waffle iron indicates. They should be nice and crispy!